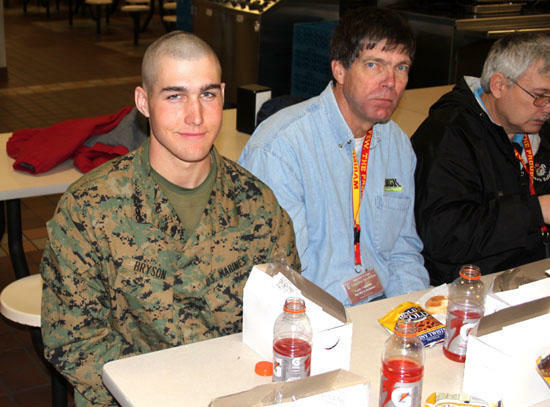 Cannon County's Ben Bryson, left, who has been training to be a Marine at the Parris Island Training Depot in South Carolina, enjoys lunch with a group of visitors from Tennessee. Three years ago, Ben Bryson was about to graduate from Cannon County High School. Like a lot of teens at that stage of his life, he wasn’t real sure what he wanted to do with his future. Should he go to college? Maybe vocational – technical school was the answer. But at the time, neither seemed to create much of a spark, certainly not one that was big enough to help young Bryson figure out what he was supposed to do with the rest of his life. Enter the United States Marine Corps. Ben, a 2007 graduate of C.C.H.S., had always thought about the military as an option. His best friend in high school is currently a Marine. So is a cousin from McMinnville. “Being a Marine is something that I have thought about for a long time,” Bryson told me during my visit to Parris Island Training Depot earlier this month. I was one of 45 Tennesseans, mostly teachers and counselors, who visited the South Carolina facility for a special workshop to see first hand what Marine Corps training is all about. I was very impressed and came away from the three-day event with an entirely different perspective of our nation’s elite fighting force. During the trip, I was hopeful of meeting a recruit or two from Tennessee. I wanted to hear straight from their mouths what their experiences had been like during the three-month training program. I never thought I’d be sitting face-to-face with someone from the same county in which I reside. “My best friend (Jimmy Freeman) has already graduated from basic training and is at Camp Lejeune (North Carolina) right now getting special training,” continued the young recruit. “We talked about the Marine Corps a lot and I think it was a good choice for me. I’ll get money for college when I get out and I hope to pursue my goal of becoming a state trooper,” added Bryson. His parents, Joe & Vicki Bryson, are excited about getting to see their son this week. The culmination of a 13-week basic training program takes place this coming Friday morning when Ben, along with several hundred other new recruits, graduates and becomes an official member of the United States Marine Corps. Ben gets 10 days off following Friday’s graduation ceremonies. He’ll return to Cannon County to get caught up with friends and share stories of what his 13-week training session at Parris Island was all about. After that, it’s back to the Corps and specialized training, probably in North Carolina. “We’re really proud of Ben,” stated his father, Joe, earlier this week. “He tried computers in vocational – technical school and that didn’t seem to work out. He worked some and even went to M.T.S.U. for a semester but none of those things really inspired him,” he continued. “Ben’s grandfather (Walter Bryson) served in the Army and was stationed in Japan during World War II. Ben also has a cousin (Bill Parsley) from McMinnville who is retired from the Marine Corps. I’d say both had a hand in helping him make a decision to join the Marines,” added his dad. I didn’t know Ben Bryson before my visit at Parris Island but I was certainly impressed with the young man I shared lunch with that day. It was obvious that he had matured a great deal from his days as a high school senior less than three years earlier. 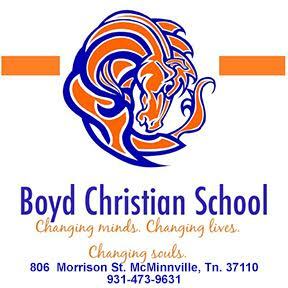 Like so many other young men and women I had a chance to visit with that week, Ben Bryson is a changed individual. The Marine Corps is certainly not for everyone but it’s a perfect fit for many. I would like to congratulate Ben on making a good choice in the military. I constantly tell all my students that if you are not sure what you really want to do with your life the military is a start. You will go away a boy and come back a man. Thank U for What u do. Our prayers will continue to be with you as you protect this country we love so much. We are proud of You here in Cannon County. I'm sure I speak for many. Way to go Ben!We are very proud of you! Congrat! Ben I am so proud of you.